Our plan for the third day of our road trip was to hang around Penticton and area. 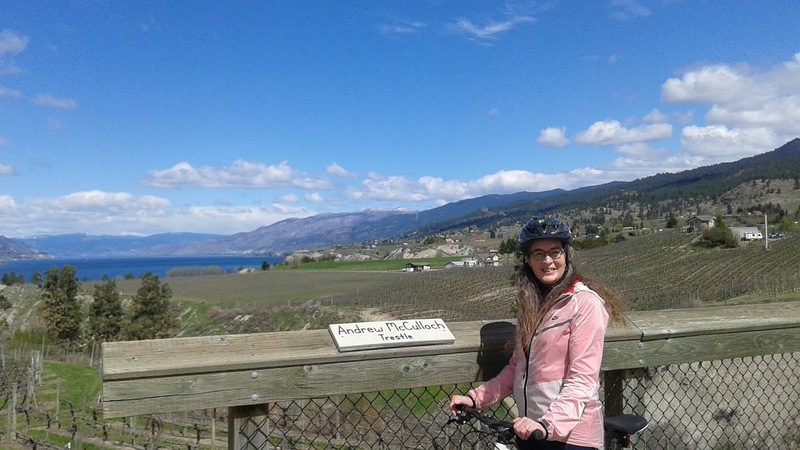 We brought our bicycles with us in order to ride a portion of the Kettle Valley Railway. The beauty of a bike trail on a rail bed is that there is very little slope (except where the trail deviates from the original route). We drove to the access point on Vancouver Place in Penticton and rode north. 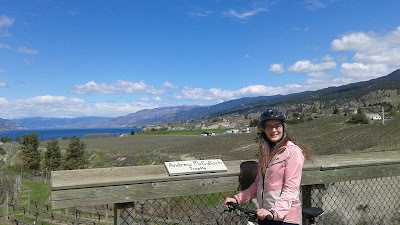 There were two main things we wanted to see on the ride the first of which was the McCulloch Trestle, named for the Kettle Valley Railway's chief engineer, Andrew McCulloch. From the trestle we continued riding to the Poplar Grove Road parking area where we stopped for a bit of refreshment. It was here that we changed plans a bit. 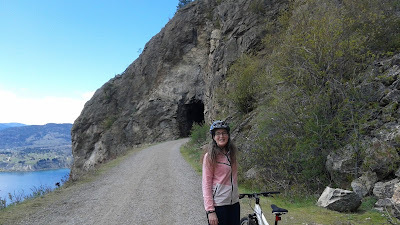 Initially we were going to ride all the way to the "Little Tunnel" above Naramata and then back to Penticton, however we decided that that was a little too ambitious for a first ride of the season. I rode back to the car and drove back to pick up Sharon then on to another access point at the Smethurst Road parking lot which cut out a big chunk of the ride. From there we made our way up the shallow grade 5km to the "Little Tunnel". After a time enjoying the views and having a bit of lunch we turned around and basically coasted back to the parking lot. One of several viewpoints along the way. Loading up the bikes after our ride. Yes they both fit inside! We drove down into Naramata where Sharon's family had come for summer vacations when she was a child. Tried to find some familiar landmarks but didn't have much luck. Down Smethurst Road into Naramata. From Naramata we drove back through Penticton, through Penticton along the beachfront, back onto Highway 97 and north to West Kelowna, our next overnight stop. Two more days to go on this trip! It's been a very relaxing time and the weather has cooperated. Would love to here your thoughts and comments... please leave them in the box below! The itinerary has us backtracking up highway 97 just a bit so we could take the scenic route down the west side Lake Okanagan down the appropriately named West Side Road. First stop... Fintry Provincial Park! The main attraction here is a triple water fall on Shorts Creek. The hike up is definitely that... up. There are more than 300 stairs leading to the uppermost viewing spot, but it is well worth the climb. No shortage of stunning views along the way. Some of the Fintry Estates' out buildings including an eight sided barn. 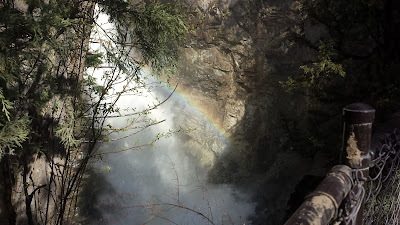 One of the three falls with a rainbow. Parts of this provincial park was originally the estate of Capt. James C. Dun-Waters. You can find out a bit more about the history of the property by following this link. The manor house has been substantially restored but unfortunately for us wasn't open for visitors yet. That is one drawback of traveling at this time of year... a lot of things aren't open until later in May or early June. Waiting patiently for its passengers to return. We drove back up the hill to the main road and turned to continue south. Next stop... Bear Creek Provincial Park, 27km (17 miles) down the road. The Festiva in its natural habitat. A short stretch of construction... they're widening the road a bit. 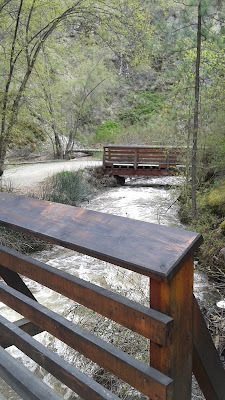 We had a few stops planned for the day so our stop at Bear Creek was a short one and we elected to stretch our legs on the very short loop adjacent to the parking lot. When we were leaving a little boy, probably about six or so, told me he liked our car! Made us both smile. ...as you can see here! Westside Road winds for another 7 km or so south from Bear Creek. The whole length of this road is a lot of fun to drive, even with the relatively low speed limits: a highly recommended detour if you have a bit of extra time. One advantage of taking the Westside Road is that you miss the drive through Kelowna. We rejoined Highway 97 just west of the City and proceeded south to our next stop... Peachland here we come! What a contrast in traffic! Highway 97 is THE major route through the Okanagan Valley so it was considerably busier than Westside Road. 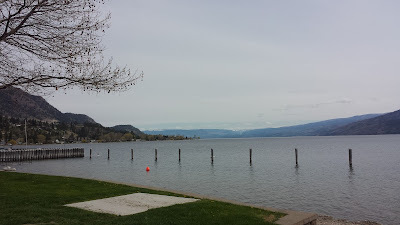 Our overnight stop was to be in Penticton but we had a couple of stops along the way. 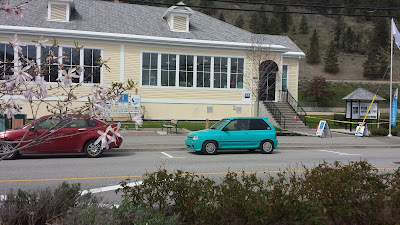 First stop was at the visitor center in Peachland via another, albeit short, detour off the main highway. 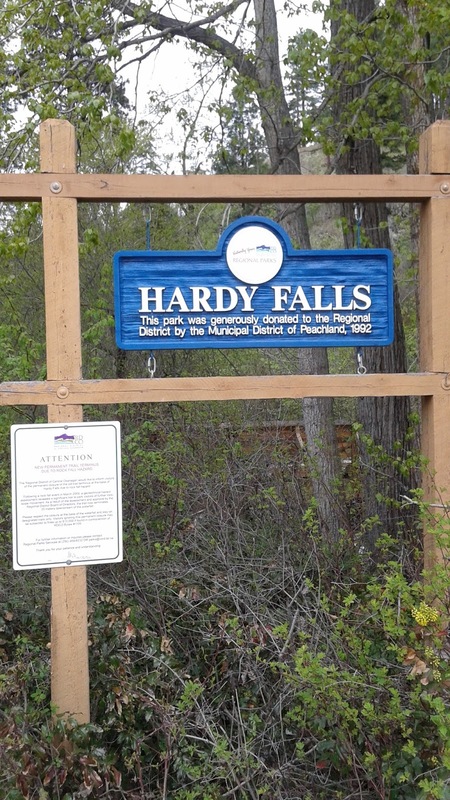 We stopped in to ask directions to our next stopping point, Hardy Falls, to tour the galllery, and to sit by the lake with a coffee and a snack. We also had the opportunity to take part in an ongoing Canada 150 event... painting a square in a large "paint by numbers" picture of a local scene. Looking north up the lake from Peachland. With directions in hand we were on our way to Hardy Falls. 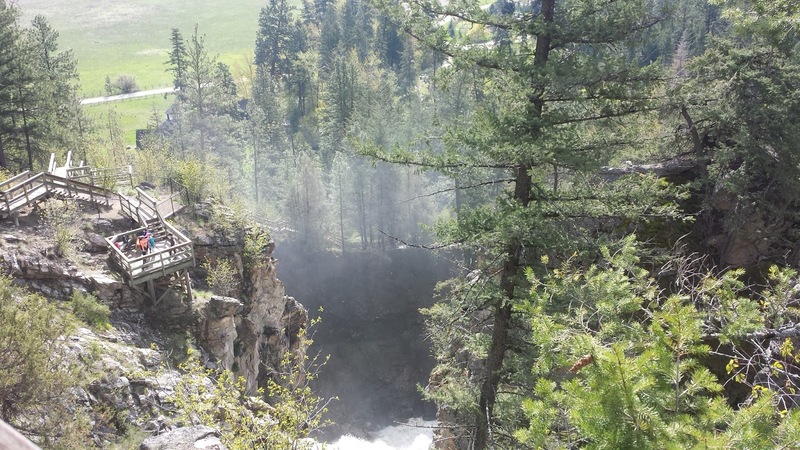 It's a very short detour off the highway with a very pleasurable 10 minute stroll across eight foot bridges to almost the base of the falls. If you visit in September/October there is a salmon run up this creek. Up the path to the falls. 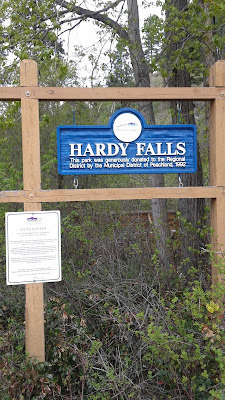 Hardy Falls from the viewpoint. Our next stop was Penticton. We were a little earlier than expected so we looked up the location of a couple of thrift stores and paid them a visit. Also hit up a local car wash. We had purchased a Groupon for a local burger place, Burger 55, so drove by it get our bearings. We knew our hotel was reasonably close and had already decided to walk both ways. Checked in and got freshened up then walked along the lakefront to our dining destination. It was a little cool but the rain held off. We both commented that in a few weeks this place would be hopping with people. A number of establishments were not yet open for their season. Burger 55 was a great experience. Our Groupon gave us basic cheeseburgers and fries. We were able to upgrade and add without any problems. The atmosphere was very casual with rustic wooden benches and tables. Being located in a former garage there was a larger overhead door that in warmer and busier times could be opened up to the patio. All in all we enjoyed it and would recommend it! After supper we strolled back to the hotel and settled in for the evening to watch a couple of our favorite shows and read a little. Tomorrow will find us on two wheels! We brought bikes and we will be heading to a portion of the Kettle Valley Road.... more on that in the next post coming soon! We'd love to hear of your experiences in this area in the comment section below. Falls into spring: day one. Sharon and I have just returned from a road trip in the Festiva and we had no breakdowns!!! Here's an account of our venture into the springtime Okanagan Valley. We got started a little later than first planned but get started we did. Our route would take us west from Calgary along the Trans-Canada Highway through Canmore, past Banff and Lake Louise then over the Kicking Horse Pass (highest spot on the Trans-Canada at 1643m / 5390ft.) int British Columbia. These are familiar roads as we follow this same route at least once each year heading to our favorite summer vacation spot at Mabel Lake Resort. Snowy mountains between Banff and Lake Louise. After a brief stop at the information center at Field BC we continued on our way westward through Golden, over the Rogers Pass and on to Revelstoke. We experienced a couple of delays due to construction but that was to be expected considering the time of year. There is still a lot of snow up high and evidence of avalanches could still be seen, especially in Rogers' Pass. Westward from Golden. Snow on the peaks in the distance. After a coffee stop in Revelstoke we returned to the highway to our destination for the night, Vernon BC. Drove past Three Valley Gap, past the Enchanted Forest, through Sicamous, down the shores of Mara Lake (more twisty bits! ), through Enderby (the turnoff spot for Mabel Lake) then to our hotel for the night. The closer we got to Vernon the greener the surroundings became, something we were looking forward to after leaving a cool, overcast and brown Calgary. Party cloudy skies and green grass greet us as we approach Vernon. One of the things we like to do when traveling is visit local thrift stores. You never know what kind of treasures are there to be discovered. Went directly to the Salvation Army Store, one of Sharon's favorites, once we arrived in Vernon then checked into the hotel. Went for a walk to another thrift store, picked up some groceries for our supper after that then returned to the hotel were we spent a lovely evening relaxing, reading and watching a show or two. I just realized that it's been six months since I last posted! I hope to start getting back to some more regular posts for the balance of the year starting with report on our upcoming road trip. Starting next Friday we'll be on the road for five days with overnight stops in Vernon, Penticton and West Kelowna in BC's beautiful Okanagan valley and one stop in Canmore AB on the way home. Planning on a couple of hikes and/or bike rides, perhaps a wine tasting or two, and maybe even some spirited driving down some twisty roads! If you have any suggestions or recommendations for some low cost activities in the area please leave a comment below. Labels: B6T Festiva, bike, British Columbia, Canmore AB, econobox, econobox cafe, Ford Festiva, hike, Kelowna, Okanagan, Penticton, road trip, Vernon, Westside Road, wine.